How do my senses compare to the senses of other plants & animals? Welcome to the teaching farm at the Outdoor School Program at the Cheakamus Centre. There are four main components to the Farm Field Study: the introduction/lesson and three experiential learning sections for chickens, goats and pigs. The theme of the Grade 4 Farm Field Study is “The Senses”. 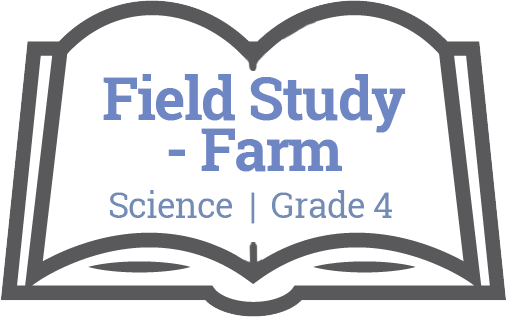 Encourage your students to notice their own senses as they sense and respond to the farm and the farm animal as they participate in this field study. Students will also learn about some of the sensational senses of the farm animal at the Outdoor School (chickens, pigs and goats) and how they use these senses to sense and respond to their environment. Note: There is a set of teacher keys to access all the farm areas, which can be obtained from staff onsite at Cheakamus Centre. The main classroom for the Farm Field Study is called the “Farm Lab” and is located upstairs in the barn. In this area you will find: chalkboard and chalk; tables and a class set of chairs; instructional posters; animal sense cards; and a Farm Study binder with instructional resources. There are no washrooms at the farm. The closest washrooms are located inside Melody Hall. It is a great opportunity to have your students Walk and Talk about their background knowledge about farms and farm animals. Ask students to pair up and as they walk to the farm, have them talk about: What is a farm? What role does a farm play in their community? Do they know where the closest farm is located to where they live? Share their answers as you arrive at the farm. The Farm Lab classroom is a good location to begin the Farm Field Study. Here you can orient the students to the components of the farm and explain that it is a teaching farm, not a working farm. This is also a good time to do any planned lessons or activities you have prepared for your visit. For example, this is a great time to circle your students up to ask them to share their names and their favourite animal. You can ask students to identify which animals are domestic and which ones are wild. What is the difference? As you visit each of the animals, use the laminated farm animal sense cards to share information about the animals senses with students. Start upstairs in the farm lab. Here you can explain about the development cycle of a chick using the poster on the wall for visual reference. There are usually several eggs in the incubator. They should have two dates on them. The top date is the date it was harvested from the hen area. The bottom date is 21 days from when the egg was harvested. Turn off the ceiling lights, turn on the projector beside the incubator, and hold up a more recently harvested egg up in front of the light. The egg will look fairly translucent and have little shading. Then take a few more eggs out of the incubator, each getting progressively older, and hold them up to the light so the students can see how the chick development compares between each egg. Be sure to replace the eggs with the wide round end up (air pocket!). If there are chicks in the cage, students can each hold the chick. Have the students sit in a semi-circle on the floor, so students can pass the chick gently around the circle. Then take the class downstairs to visit the hen nesting area and harvest some eggs. On the grass outside, go over behaviour expectations with the students. Inside the hen nesting area, students should be quiet and gentle when reaching into the hen beds. Take the students inside and explain about the lighting. Chicks usually lay eggs in the spring and summer and the lighting is left on to simulate the longer daylight hours. Students can then reach in and take some eggs. If it’s the morning field study, only take half of the eggs so there are some for the afternoon field study to use. Take the eggs back upstairs. The warmest egg should go in the incubator. Using the pencil on the fridge, write the current day’s date on the egg. Using the calendar on the wall, count ahead 21 days and mark that date on the egg as well. Gently place the egg in the incubator, pointy-side down and round-side up. This will ensure the developing chick has access to the air sac inside the egg. 2. Wash eggs individually under running water. Scrub off surface dirt using the green plastic scrubber kept beside the sink. 3. Sanitize with bleach and water solution (instructions are located on the bucket beside the sink along with the bleach). Dip eggs in solution and let air dry in egg crates. 4. Once dry, date eggs and place in fridge. Record the numbers on the chart on the fridge door. After you have finished with the eggs, you can go outside and feed the chickens. The feed is located downstairs in the hen nesting area. There is a bucket on top of the feed container. Fill the bucket up to the fill line on the outside of the container. This is not the chickens’ main meal for the day; it is only a snack. Note: If there are two groups doing Farm Field Study at the same time, they should share the amount of feed. This will prevent the chickens from being overfed throughout the day. When feeding the chickens, students should lay their hand out flat and let the chickens peck the feed from them. If at any points students are afraid, they can drop the feed and walk away. If children are nervous, they can try feeding the hens first, as they are usually more gentle. When you are finished, direct the chickens back into the pen where they came from. Start by taking the students into the goat barn and showing them the facilities. The feed container is located inside the door on the left-hand side. Fill the bucket up to the fill line on the outside of the container. This is not the goat’s main meal for the day; it is only a snack. Note: If there are two groups doing Farm Field Study at the same time, they should share the amount of feed. This will prevent the goats from being overfed throughout the day. The goats are extremely enthusiastic to receive the feed. To help keep things manageable, don’t take the feed bucket into the goat pens. Hand out the feed to the students at La Grange and put the bucket back on top of the feed barrel before heading over to the field. Instruct students to cover the feed with their hands as the approach the gate, then walk directly into middle of the field before feeding the goats. If there is a bottleneck at the gate, the goats will crowd the students and some may leave the pen. When in the goat pen, students should remain standing at all times. When feeding the goats, students should lay their hand out flat and let the goats take the feed from them. If at any points students are afraid, they can drop the feed and walk in the opposite direction of the goat. The goat’s interest will be with the feed. Students can also groom the goats using the brushes in the basket. There is also a stethoscope in the basket. One at a time, students can place it on the side of a goat and try to hear a baby goat’s heartbeat inside. Both of these are good activities for students who may be afraid to feed the goats but still want to interact inside the pen. Once you have visited all the stations at the farm, go back upstairs to the Farm Lab and have students wash their hands. There are two sinks. Students can place used paper towels in the compost bin in the classroom. Note: You can vary the order of the stations as you see fit. 5. What animal sense surprised you the most?